Carney's father, Jim, is a retired longtime reporter for the Akron Beacon Journal and a music lover whom Carney credits with introducing him to various genres. His mother, Mary Stormer, is Civil Accounts Supervisor for Akron Municipal Clerk of Court and is a former member of the Akron Board of Education. His stepmother, Katie Byard Carney, is a longtime reporter for the Akron Beacon Journal. His stepfather, Barry Stormer, owns B. A. Stormer Construction Services. Carney has three brothers, William, who is an Amtrak supervisor, and Michael, a graphic artist who has created the art for each of the Black Keys albums and in 2017 launched the Central High Tshirt line. Barry Stormer Jr., Capital Markets analyst for Keycorp. Carney's uncle, Ralph Carney, was a professional sax player, and played with Tom Waits, among others. Ralph died in December, 2017, after falling down steps in his Portland, Oregon, home. After Carney's parents divorced when he was 6, he lived part of the time with his mother, Mary Stormer, and part of the time with his father, Jim Carney, who had moved to a different neighborhood in West Akron, Ohio. Dan Auerbach lived around the block in this neighborhood, and the two met and played tag football with Auerbach's friends, although Patrick and Auerbach did not become friends until high school. Carney stated in an interview with Modern Drummer that he never took drum lessons as a kid, but learned by mimicking friends that were also drummers, using a $150 drumset that he bought using money earned from a job washing dishes at the Mustard Seed grocery and cafe in an Akron suburb, Bath Township. As a teenager, Carney was musically influenced by bands such as Pavement, Captain Beefheart and fellow Akron band Devo. In 2001 Carney and Auerbach, lead singer and guitarist, formed The Black Keys, releasing their debut album The Big Come Up less than a year later. This was followed by Thickfreakness in 2003 and Rubber Factory in 2004. The band's fourth album Magic Potion was released in 2006. Attack & Release, their critically acclaimed fifth album was released in 2008, with a follow up in 2010 titled Brothers. In 2011, the band released the album El Camino. The band's latest album is Turn Blue, released in 2014. They released their first single in five years, "Lo/Hi", on March 7th, 2019. Carney currently produces and writes music out of his Nashville based recording studio, Audio Eagle. He has produced a range of artists from various musical backgrounds including The Black Keys, Michelle Branch, Calvin Johnson , Tennis, The Sheepdogs, Beaten Awake, Houseguest, Churchbuilder, Jessy Wilson , and *repeat repeat . In 2009, while fellow Black Keys member Dan Auerbach was on his solo tour, Carney formed a new band called Drummer in which he played bass. Each of the band's members had played drums in another band. They released Feel Good Together, their debut album in the same year. Carney is the drummer on The Rentals' 2014 album Lost in Alphaville. Carney also contributed the main title music to the 2014 Netflix show BoJack Horseman. In 2017, Carney contributed music to the soundtrack of BoJack Horseman. Carney, living in Akron, Ohio, married writer Denise Grollmus, in 2007. The two had dated for several years, since Grollmus was a student at Oberlin College in Ohio and Carney and Dan Auerbach launched the Black Keys. The couple divorced in 2009. Both talked about the messy breakup in the media, Patrick in Rolling Stone's May 27, 2010, issue and Grollmus in an essay - "Snapshots From a Rock 'N' Roll Marriage", published in Salon on March 3, 2011. In 2010, Carney and his bandmate, Dan Auerbach, moved from Akron, OH, and purchased homes in Nashville, TN. They recorded their El Camino album at Auerbach's newly completed Nashville studio, Easy Eye Sound Studio. Carney married Emily Ward, whom he had met while living in New York City, on September 15, 2012, in the backyard of their Nashville home. The wedding ceremony was officiated by actor Will Forte. Karen Elson, a singer and ex-wife of Jack White of the White Stripes and a Nashville resident who was friends with Carney and Ward, sang at the wedding. The wedding party included Ward's siblings Danielle Shuster and Henry Ward, Carney's brothers Will Carney, Michael Carney, and Barry Stormer, and the couple's Irish wolfhound, Charlotte. Wearing Carolina Herrera, Ward walked down the aisle to Crimson and Clover by Tommy James and the Shondells. Carney and Ward invited 350 guests, including bandmate Dan Auerbach and professional snowboarder Shaun White, who was later arrested and charged with vandalism and public intoxication at a hotel in Nashville after the wedding reception. Carney and Ward divorced in January 2016. Ward, a California native, had moved to Los Angeles by that time. In 2015, Carney met Michelle Branch at a Grammy party, and the two started dating during the production of Branch's album Hopeless Romantic, which Carney produced. On Michelle's birthday, July 2, 2017, he proposed and Branch accepted. On February 11, 2018, Michelle Branch announced that she and Carney are expecting their first child. The baby was born in August 2018, named Rhys James Carney. Carney and Michelle live in Nashville with their children and two Irish wolfhounds, the aforementioned Charlotte, and Darla. Carney and Branch married in April 2019. ^ "The Rentals Sign to Polyvinyl for First Album in 15 Years". Rolling Stone. Wenner Media LLC. December 5, 2013. Retrieved September 18, 2014. ^ Grollmus, Denise. "Snapshots from a rock 'n' roll marriage". ^ "Snapshots of a Rock n' Roll Marriage". Salon. 2011-03-03. Retrieved 2012-05-15. 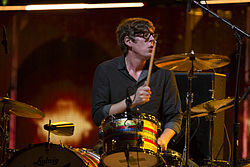 ^ "Black Keys' Patrick Carney Gets Engaged | Music News". Rolling Stone. 2011-02-15. Retrieved 2011-10-09. ^ "Black day for Auerbach". news.com.au. News Limited. 2013-02-12. Retrieved 2013-02-12. ^ "The Black Keys Wedding: Patrick Carney Marries Emily Ward". 20 September 2012. ^ News, ABC. "Olympian Shaun White Arrested". ^ "Michelle Branch & New Boyfriend Patrick Carney Made an Excellent Pop-Rock Album: 'It Was Us Against The World'". Billboard. Retrieved 2017-03-27. ^ "Michelle Branch Gets Engaged to Patrick Carney". 3 July 2017. ^ "Michelle Branch & Patrick Carney Welcome Baby Boy". Billboard. Retrieved 2018-08-31. ^ "All She Wanted! Michelle Branch and Patrick Carney Welcome Son Rhys James - See His First Photo". PEOPLE.com. Retrieved 2018-08-31. ^ "Michelle Branch Marries the Black Keys' Patrick Carney in New Orleans". People.com. ^ "Karen Elson Enlists Father John Misty, Black Keys' Patrick Carney for New Album | Pitchfork". pitchfork.com. Retrieved 2018-11-06. This page is based on the Wikipedia article Patrick Carney; it is used under the Creative Commons Attribution-ShareAlike 3.0 Unported License (CC-BY-SA). You may redistribute it, verbatim or modified, providing that you comply with the terms of the CC-BY-SA.